Mangalore/Kasarago, Sep 1, 2014 :Wide potholes between Mangalore and Kasaragod (Kerala) on the national highway 66 and uncompleted highway widening works between Mangalore and Talapady have made journey difficult for people. Aakash, a daily traveller between Manjeshwar (in Kerala) and Mangalore said that huge potholes have appeared near Kumpala, Uchila and Talapady. “It is very difficult for two-wheelers to ride between Talapady and Mangalore,” he said. Potholes have appeared in the narrow stretches where the highway has not been made into four-lane with works pending. In such places, traffic jams have become common during mornings and evenings, said Kishore Kumar, a college principal who visits his native place at Kasaragod during weekends. The constant rainfall in the last few days has aggravated the problem, with water filling up the potholes and resulting in an ordeal for the drivers. Smaller vehicles can be found literally wading through the puddles on the roads. The problem has worsened with a spurt in passenger and freight traffic in view of the upcoming Onam festivities. Deep potholes that have developed in Manjeshwar, Kumbla, Periyatadkkam and Periye make it difficult for the swift movement of Mangalore-bound ambulance vehicles from northern parts of Kerala. Besides, buses going via the Cherkala bus station have to face the ordeal of plying on a badly damaged approach road from the national highway as the authorities failed to carry out the required repair works before the monsoon. Finding it difficult to maintain time due to the poor roads, many State road transport corporation buses from Kerala and Karnataka are reportedly cutting short their services on the Kasaragod-Mangalore stretch, causing great inconvenience to students and office-goers during peak hours. The widening works along the 27km parallel Kasaragod-Kanhangad State Highway under the Kerala State Transport Project (KSTP) has intensified the hardships caused to people. 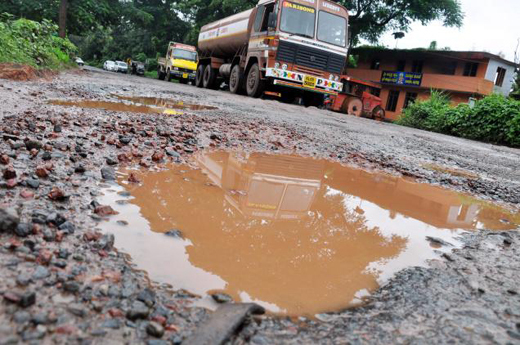 Shriram Mishra, Project Director, National Highways Authority of India (NHAI), Mangalore Project Office, (responsible for widening the highway between Talapady and Kundapur) said that potholes between Mangalore and Talapady would be filled once heavy rainfall stops. He said the highway-widening works were expected to resume either in October or November as the concessionaire, who had taken up the project, was facing financial problems.